TOKYO — JTB announced Tuesday a capital and business tie-up with Indonesia’s biggest travel agency, seeking to make inroads into a promising market as well as further its global ambitions. The Japanese travel company will spend several billion yen for a 40% stake in Panorama Tours Indonesia in March. JTB plans to use Panorama’s customer base and network of 53 locations across 24 cities to sell Japanese tours and other products. The number of Indonesian visitors to Japan grew 32.1% in 2016 — faster than for any other nationality. JTB President Hiroyuki Takahashi, second from right, and leaders from Panorama Tours Indonesia announce their new partnership in Tokyo on January 31. Panorama — a core unit of Panorama Group, Indonesia’s largest integrated travel group — arranges overseas trips for Indonesian travelers. It reported revenue of 1.92 trillion rupiah ($143 million) in 2015. 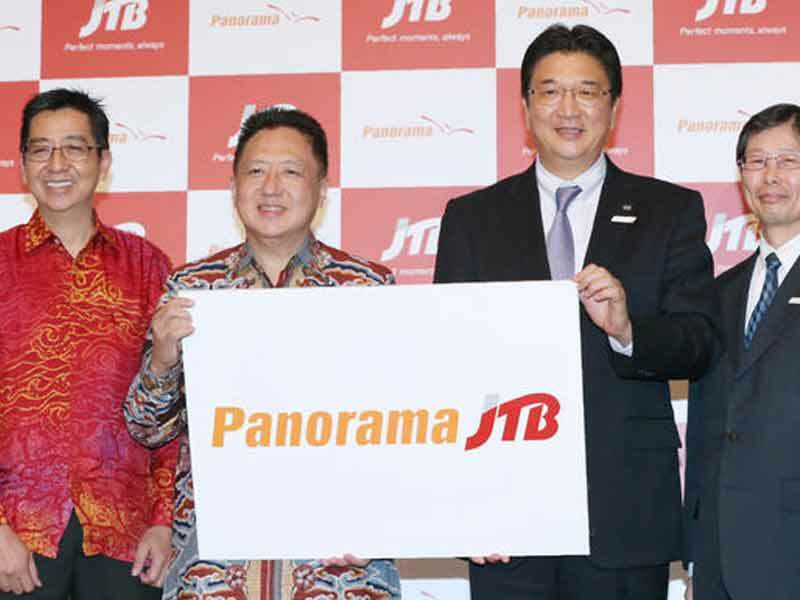 As part of the deal, Panorama will integrate with JTB’s Jakarta branch, changing its name to Panorama JTB Tours Indonesia and displaying the JTB logo on its offices. It will broaden its lineup of trips and travel products, including for countries besides Japan. The company will work to cultivate corporate demand for international business trips as well as travel for meetings, conventions and exhibitions. Japanese travel agencies have been unable to fully capitalize on the influx of foreign visitors, seeing their market share eroded by travel-booking websites as well as tour operators with cheaper products and no barriers to entry. “We’ll leverage the flow of [visitors] from Asia to make JTB Asia’s No. 1 travel agency,” President Hiroyuki Takahashi told reporters here. JTB aims to boost annual revenue from global operations, a category covering trips by non-Japanese travelers, to 750 billion yen ($6.66 billion) in 2020 from about 400 billion yen in 2016.